International Trade Terms & Transactions. All Export Import Licensing Formalities. After gaining a rich and varied experience for more than 13 years in the field of International Trade, Export - Import, it was in the year ending 1986 the Export - Import Consultancy Services were launched in Chandigarh, India by Mr. S. K. Gupta in his individual capacity as International Trade Consultants. 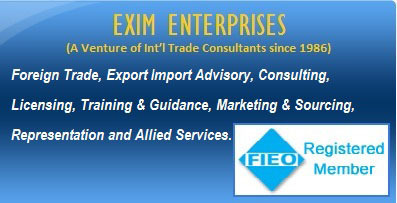 To give it a more professional look, the firm, Exim Enterprises was established in April 2008.
a) Office of the Joint Director General of Foreign Trade (JDGFT), Ministry of Commerce, Govt. of India, as Service Providers. d) Member of Confederation of Indian Industry (C.I.I.). f) Member of Chamber of Indian Micro Small and Medium Enterprises (CIMSME). The main aim and objective of starting such kind of services was that earlier there was not even a single Agency, Consultancy Firm who could have provided complete consultancy under one roof in the field of Export - Import, International Trade, with a professional touch, transparency, quick results, right information, advise & solutions. The first office was established at Quite Office Building No. 12, Top Floor, Sector -35 A, Chandigarh, in the year ending 1986, which was later shifted in the year ending 2004 to a more spacious and well equipped premises at # 1474, F.F, Sector 42- B, Chandigarh, which is a tribute to the enterprising spirit of Mr. S. K. Gupta's beloved son Vebhav Gupta, who was a very talented and multifaceted personality but was passed away in the prime of his youth on March 13, 2004. The new office is dedicated to my late son's loving and fond memory. A Charitable Trust "Vebhav Gupta Charitable Trust" has also been established to extend moral & financial support to poor Patients, Students, Destitute and other such needy individuals, in his loving memory. W.e.f 1st April'2016, the Office has been shifted from First Floor to Ground Floor, Back Side Entry in the same building. During the last 32 years as on year 2018, since the establishment of our Consultancy Services, we have catered to the requirements of more than 2300 Clients in India and abroad, while successfully handling various kind of assignments relating to Export - Import matters, Licensing, Permissions, Clearances, Marketing & Sourcing for Export - Import Products, Joint Ventures & Technology Transfer tie-ups, and opening of Overseas Offices of Indian Exporters and much more while traveling abroad frequently to different countries on behalf of our clients for such assignments. Beginning Year 2010, we have also started imparting Training and Coaching in Foreign Trade, Export Import Business to any interested Individuals, Students, Companies Executives, Manufacturers and Traders etc. The Coaching is based on Practical aspects with latest Trends, Trade Terms and Transactions and is provided to Individuals on one to one basis. Mr. S. K. Gupta has also written a Book on "Training for International Trade, Export - Import Business", which is the first of its kind in India and for which Govt. of India has granted Copyright in the year 2010. An updated revised version of the same, now named as "Practical Aspects of Foreign Trade - Training & Guidance in Export - Import Business" has been written in the year 2018, which is under Copyright. © 2009, Exim Enterprises, All rights reserved.